Howdy, everyone! LionWing president Bradly Halestorm here, and today we bring to you a look at one of Sainome Colosseum R's ten playable characters, the Broke Magus/Magus, Magic Unleashed. We'll be taking an in-depth look at the character's lore and gameplay while exploring both his Normal Form and Awakened Form. So without any further ado, let's get to it! The kingdom's most celebrated warriors have come from far and wide to do combat in a grand tournament that will determine who is the fiercest of them all. Each has a personal reason for competing in the event, but there is a single thread that unites all of them: the desire to put their fighting skills on display in order to earn the right to be called champion. As we can see here, fighters from all around the realm are gathering to compete in this gladiatorial contest. Each has been brought to the tournament for their own reasons but all have the goal of being the last warrior standing. There’s more to it than this story, however. The royals who have set up the tournament have promised its winner both riches and fame, which has undoubtedly played a significant factor in many of the contestant’s decisions to enter the event. Furthermore, there’s also a rumor circulating that the winner of the tournament may even be eligible to wed the kingdom’s princess, though no one can confirm the validity of such conjecture. Now, let’s look at how today's character fits into all of this. Rarely seen, the Magus is a recluse who spends every waking hour poring over arcane texts in the hope of one day arriving at the universal truth of the world. Seeing the tournament as a way to refill his coffers, he plans on using his unrivaled magic skills to destroy the competition. The magus is both eccentric and a bit anti-social, what with being a hermit who spends his days poring over arcane texts. We can clearly see from the blurb above that his ambitions to uncover what he refers to as the "universal truth of the world" have ultimately led him down an isolated path where books are more his friend than actual people. But when he is around others, such encounters likely do not go smoothly or as they would normally with someone who possesses better people skills. In fact, while it's not explicitly said, we can picture the magus being either unknowingly aloof or condescending—due to likely thinking exceedingly high of himself—in social situations, although it's improbable that he would even care in the first place how he comes off to others. The other interesting part about the magus is his apparent broke-ness. This juxtaposes comedically against his aforementioned strong sense of self in that, for such a talented wizard, one would assume he would have plenty of coin to go around. But no, dude's broke as a joke and is simply using the grand tournament to make back the money he's probably lost in crack-pot theories and alchemical experiments. Nothing is as terrifying as a more than capable mage with nothing to lose and everything to gain. Let's discuss the character's playstyle by starting with his Normal Form abilities first. The Broke Magus has two abilities, the first being "Economics," which states that the player does not need to discard cards to use certain Magic-based Sainome Cards. In the game, players will draw and play cards that require them to discard cards from their hand to activate a certain effect. Economics, however, forgoes that rule entirely, allowing the Magus to keep all of his cards in his hand. This can be especially useful if there are cards that you want to hang on to that you would normally have to get rid of to activate some kind of effect. The Broke Magus's second skill is his awakening trigger ability, "Summoning Hex." Summoning Hex is a great trigger ability in that it's completely up to the player as to when they will awaken. Unlike other fighters that require players to be a certain HP threshold, Summoning Hex allows players to choose when they transform into their Awakened Form. This grants you the opportunity to plan a strategy around this ability, giving you better control over when and under what circumstances you'll unleash the powerful abilities associated with the Magus's Awakened persona. Speaking of which, this character's Awakened Form—the Magus, Magic Unleashed—is more involved than the Broke Magus, giving folks three abilities from which to choose instead of merely two. The first skill, "Alter Fate" states that when attacking, you may discard a card to reroll the die (may be used multiple times in a single Attack action as long as you have cards in the hand). As one might be able to tell, this ability is intended to be used on attacks that are heavy-hitters, that one can't afford to miss. Due to the chance to reroll multiple times, effectively using this skill all but guarantees a successful blow, and can change the tide of battle in an instant. His second ability, "Elixir of Magicks," is similar to Economics in that it deals with discarding. Elixir states that when using Magic, you do not need to discard cards to meet the catalyst requirement. Moreover, Elixir increases magic damage by +1. This turns the magus into a proper cannon who's able to rain down powerful magic-based attacks that can dismantle an opponent's entire game plan. It would be a powerful ability if it merely buffed magic attacks, but to then throw in the bit about not needing to discard discard-dependent attacks makes this a true one-two punch. 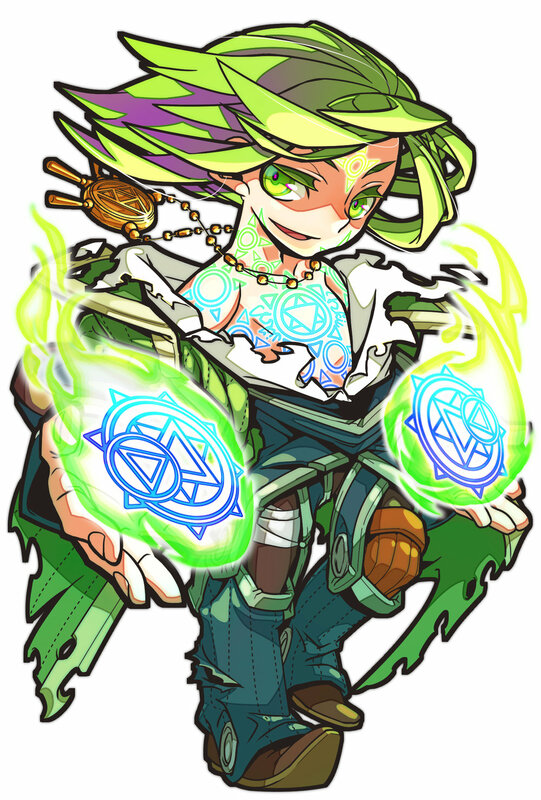 The magus's final Awakened Form ability is his Normal Form transformation trigger, "Disenchantment," which states that when the magus draws a card, he reverts to the Broke Magus. This trigger exists to offset the sheer carnage the Magus, Magic Unleashed can cause if given too long in his Awakened Form. So the key, then, is to utilize abilities and equipment cards to avoid having to draw cards. Of course, that's easier said than done. The magus, regardless of Form, is a beast, though only under the right conditions. Much of the character's powerful skills are only capable if the player can draw Magic cards and then find a balance between attacking with them and stockpiling them for when he gets into his Awakened Form. If played well—and with some luck of the draw—this character can win games in just a few turns. But that's also his downfall: because he relies so heavily on the draw, if he gets starved for usable cards or the player doesn't have a firm strategy in mind (as well as a back-up strategy if said draw is lousy), he can simply never find an attack rhythm. Thus, the magus is a "go big or go home" type character that can destroy opponents in record time, or get destroyed in record time. And that'll wrap up this entry in our Character Spotlight series! As always, if you have any questions or comments for us about the characters as we go along, don't hesitate to hit us up on Twitter, Instagram, Facebook, or in the comments section below.